Whimsey can also be a noun demonstrating the trait of acting unpredictably and more from whim or caprice than from reason or judgment. I have discovered too that whimsey can be spelled with and without the “e”, depending on its use. Bet I have misspelled it in the past and probably will do so in the future. We shouldn’t be afraid to embrace whimsy, that nagging idea that life could be magical; it could be special if we were only willing to take a few risks. Creativity does not belong exclusively to professional artists and geniuses; it is the birthright of every single human being. Creativity is our common heritage. You don’t need to quit your job and move to Paris in order to lay claim to this heritage – all you have to do is clear some space in your life for whimsy, invention, sensory pleasure, and play. Most of all, you have to learn how to follow your curiosity more than your fear. Living a life fully engaged in full of whimsy and the kind of things that love does is something most people plan to do but along the way they just kind of forget. If God brings our pets back to life, it wouldn’t surprise me. It would be just like Him. It would be totally in keeping with His generous character… Exorbitant. Excessive. Extravagant in grace after grace. Of all the dazzling discoveries and ecstatic pleasures, heaven will hold for us, the potential of seeing Scrappy would be pure whimsy-utterly, joyfully, surprisingly superfluous… Heaven is going to be a place that will refract and reflect in as many ways as possible the goodness and joy of our great God, who delights in lavishing love on His children. The Words of Whimsey – Theological? “But somewhere along the way, the fanciful nature of God’s work was pushed to the background as unimportant. Whimsy doesn’t have the gravity or credence that Law has. Laws are easier to manage. One knows where one stands if God is all about laws, and requirements, and prohibitions. Thou shall not, thou must always, thou had better…. The mainstream of the church has preferred to focus on the law. That aspect of God’s word has held the stage for a long time. Punishment and retribution and vengeance – those are things we think are in God’s domain. Grace, forgiveness and mercy flow from them as the gospel response. But the gospel, then, is just as weighty in balance. There’s nothing fanciful about confession and forgiveness, right? It’s soul searching and release of the burdens that we bear. It’s important, transformational. There’s nothing fanciful about the smudge of ash on our foreheads that reminds us that we are ashes and to ashes, we return, that from ashes we shall arise. There’s no playful splashing about in the waters of baptism. Martin Luther stressed that we drown in those waters – death itself and sin and our old nature drown. We come out of the water a new creation: Gasping, perhaps, but not playfully splashing. It’s all very serious. But once in a while, once in a while hidden away in a secret covey of images, we find righteousness and peace kissing, or trees clapping their hands as they otherwise grow placidly beside still waters, or mountains bursting into song, or wildflowers decked out in more beauty than Solomon can ever muster even with all his wealth. Once in a while, we find pure whimsy. The Leviathan of Psalm 104 – the sea monster that God made for the sport of it. Or a whale that does God’s bidding in redirecting a reluctant prophet Jonah to save the Ninevites. Or angelic messengers who visit an old man and an old woman in the desert and tell them a baby will be born in the geriatric ward, and the old woman, Sarah, cracks up laughing; or maybe the same messenger centuries later who visits a young unmarried slip of a girl in Nazareth of Galilee – who tells her, “God has chosen you for great things and great joy for all people, for a child will be born to you and his name shall be Jesus, Immanuel, God with us. It’s a whimsical story, this biblical tale – but that doesn’t mean it’s less true than the Law and prohibitions – it means that God comes to us in joy, intends for us to experience good news of great joy in our lives, intends for us to find in God the fanciful potential of new beginnings that can lift us out of our selfishness or pain or lack of imagination for anything we can’t touch or eat or drive. Imagery can change your life. Imagination can alter your reality. Where do I go with this hodge-podge of words about whimsey? First I will pay attention to what God will show me about this concept. Listen deeply. Watch for moments. Name the feelings. Form the questions. Second, I go on a short retreat in a few weeks – I plan to pray, listen, and journal about my three WWW’s. 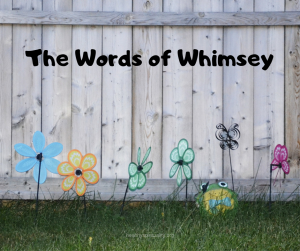 I will consider this question: How does whimsey relate to creativity, joy, and life? Isn’t there an element of whimsey in this Bible verse? I want to talk with God about the following quote. We take the world too seriously and “adulty” and missed the delight God gives us every day. I have much to process yet with this first step into God and whimsey. What stands out for you in this post? What other questions would you ask? I appreciate your take on whimsy, Jean. And I love seeing so many of my favorite authors quoted! 🙂 It reminds me to go get tickets now for a Bob Goff event coming my way in May! I think this will be a great exploration -am hoping to learn and become more joy filled too. Did you get the tickets? Isaiah spoke afresh to me. Fun and joy are often not promoted amongst us. What stands out for me, Jean, is joy – we can’t take joy in the Lord, which He desires us to do, if we’re too busy being serious about everything. I loved Chesterton’s example of how children will ask us to do things over and over – oh, how I could relate to that! They never lose their wonder, delight and joy in repeated tasks, especially when it strikes them funny. We need to do the same, lest we grow too old too quickly. I’ll be focused on whimsy today as I play with my grandchildren! Yes lots of joy and creativity found in whimsey, isn’t there? More childlike too. GRandchildren will bring that out in both of us. Wonderful thoughts and quotes on whimsy. What stands out most for me, is that we are too serious and adulty. It’s easier to focus on the law side of the Divine than to abandon ourselves to joy and delight in ourselves and the world – all the creation of God. To abound on ourselves to whimsey would be to let go, to have faith. To trust that God will provide for us just as he does for all of his creation. Until we can embrace our child within the weight of the world – seemingly ours alone to bear – will keep whimsey and wonder and wisdom at bay. The question moving forward is, what am I holding onto that is taking away my ability to find delight in all the wonderful creations of God?